In this vegetarian tandoori-inspired recipe, paneer is coated in a yogurt sauce, smothered in tandoori spices, and grilled on skewers just until lightly charred. Serve it up with extra sauce. Yum! Didn't know you can grill paneer? You can, indeed! Like traditional Greek halloumi cheese, Indian grilled paneer works well on your indoor or outdoor grill, as it becomes lightly charred instead of melting away like other cheeses. 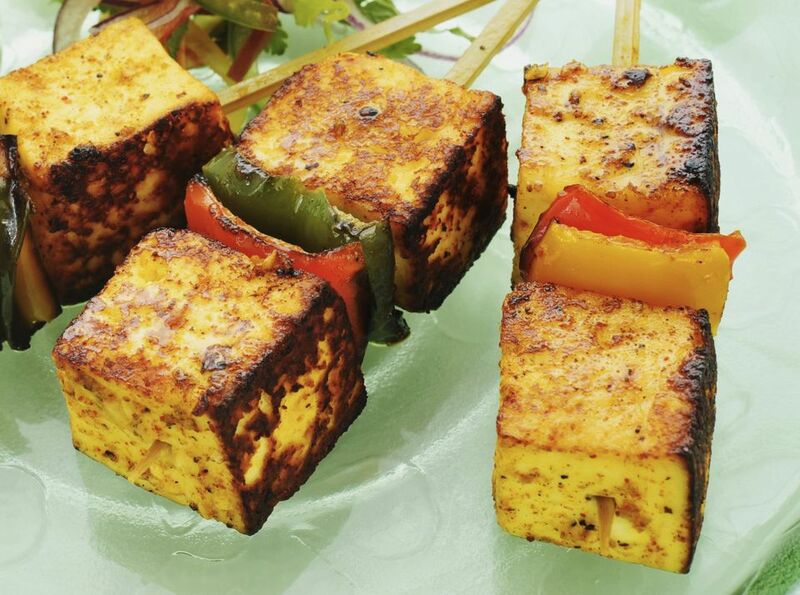 If you've never tried grilling cheese before, you're in for a real treat with this tandoori-spiced grilled paneer recipe. Most larger natural foods stores (such as Whole Foods or larger independent grocers) will stock paneer and tandoori seasoning blends. You also may want to see if there's a local Indian import grocery store in your area. Need a vegan tandoori grill recipe? Try swapping out the paneer for tofu and use a vegan soy yogurt for the marinade instead -- it'll still be delicious and colorful, thanks to the strong tandoori seasoning blend of spices, which is where the real flavor comes from. Enjoy! This grilled paneer recipe is vegetarian and gluten-free (but check the ingredients on your spice blend to make sure there are no hidden additives just to be certain if needed). Whisk together the yogurt, tandoori spice blend and cayenne pepper in a wide, shallow bowl or container. Add the chopped paneer, coating well with the yogurt sauce. Allow the paneer to marinate for at least one hour, and, if you have the time, a little longer. Check the cheese once or twice to make sure it's still covered with sauce, and turn or re-coat it once or twice as needed. Preheat an indoor or outdoor grill to medium-low heat. Skewer paneer on soaked bamboo skewers, and grill for 5 to 7 minutes, or until lightly charred, coating well with extra sauce. Serve your grilled paneer drizzled with extra sauce, or serve the extra sauce on the side for dipping. You can also make paneer kabobs by adding different ingredients to the bamboo skewers. Choose vegetables which take about the same time to cook as the paneer. Chunks of bell pepper, quartered sweet onions and mushrooms are traditional grill ingredients which would all work well.